The Principles of HEPA filters – How do They Work? 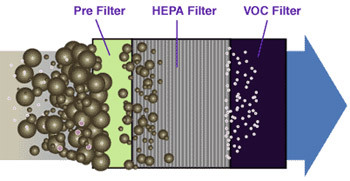 How Exactly Does HEPA Filtration Work? If you are reading this page, it can only mean one thing: you’ve stumbled across a review on an air purifier that caught your interest. However, you’re confused by a bunch of strange acronyms which mean absolutely nothing to you. Most people are somewhat intimidated by these so they give up on the purchase altogether or, even worse spend their money on an air purifier without knowing what it is they’re buying. Today’s mystery word is HEPA which stands for High Efficiency Particulate Air. For some insight on how it works, its history and applications as well things to look out for keep reading. It’s hard to pinpoint the exact moment when HEPA filters were invented. Perhaps it’s more accurate to say they were developed over time, but the first recorded use of HEPA filters occurred during the Manhattan Project (yes, that Manhattan Project the same one that produced the first atomic bomb). Basically, HEPA filters were employed to stifle the dispersion of radioactive particles inside research labs. The next important chapter in the history of HEPA filters came about in the 1960’s when German brothers Klaus and Manfred Hammer introduced the first commercially accessible filtering systems. These were used to reduce the concentration of airborne soot particles as a result of using coal-burning stoves. They would go on to form one of the most renowned companies involved in the production of air cleaners called IQAir whose model, the HealthPro Plus I’ve reviewed on my website. In order to make a HEPA filter glass fibers are used, and thanks to the unique configuration they’re arranged in air is able to pass through the filter while large contaminants such as allergens, mold or dust are captured. The pollutant particles are captured using several different principles. For the most part particles come into contact with the filter, and are then trapped based on the principle of adhesion while clean air is free to circulate. Other cases include contaminants being trapped after achieving partial contact with the glass fibers, or being pressed up against the filter because of the strong air flow inside the purifier. Furthermore, airborne particles are attracted by other particles which are already trapped by the HEPA filter. Thanks to these various ways of stopping contaminant particles before they are able to pass through, HEPA filters can collect 99.9% of airborne impurities as long as they’re larger than 0.3 microns in diameter. Since most contaminants fall into that category, just imagine how much of an impact these filters have on the quality of air you breathe. Stuff like dust, allergens, pollen, dust mites, pet dander, mildew and mildew spores are eliminated with the use of a HEPA filter(especially useful for people who suffer with asthma or hay fever). Just like all air purifiers aren’t created equal, HEPA filters too differ from one another. So, I would like to shed some light on things you should look out for if your air purifier of choice has a HEPA filter. First of all, there are a lot of air purifiers out there which are advertised as having HEPA filters, but actually don’t. Usually these are disguised as having HEPA-like filters, and don’t meet strict HEPA standards. You just have to look carefully because HEPA-type filters are sometimes advertised as being able to stop 99.9% of contaminants larger than 3.0 microns, which is nowhere near the level of filtration offered by True HEPA filters. That doesn’t make them useless since they are still able to capture large particles, but it’s your responsibility to get all the facts straight. Hopefully my website will do just that for you. Another thing you have to realize is even a True HEPA filter can’t do everything, and this is why you should always look for an air purifier that also has a pre-filter. These capture larger particles such as dust, pet hair and lint etc. This maximizes the effectiveness of HEPA filters and increases their longevity since they won’t get clogged up or damaged. Also, don’t expect HEPA filters to deal with nasty smells, odors and VOCs. This is what the activated carbon filter is for and you should, if possible, go with a HEPA purifier which also features an activated charcoal filter. These filters, thanks to their porous nature are extremely efficient at trapping chemical vapors, fumes, odors and gases. This triple-level protection is what you should always aim for and most top of the line air purifiers feature this combo. Well there you have it! This is pretty much everything you need to know about HEPA filters. I have covered their history and inception, the way they are made and how they work. I’ve also included several considerations regarding air purifiers which feature HEPA filters. Of course, while these are extremely effective at battling airborne particles which are the leading cause of allergies and asthma attacks, they are no substitute for your allergy therapy.